It's a fact: I love blue nail polish - but it has only been within the past few years that my attraction towards these shades has truly grown. If you asked me 5 years ago, there wouldn't have been a hint beyond pinks and corals in my nail polish collection. 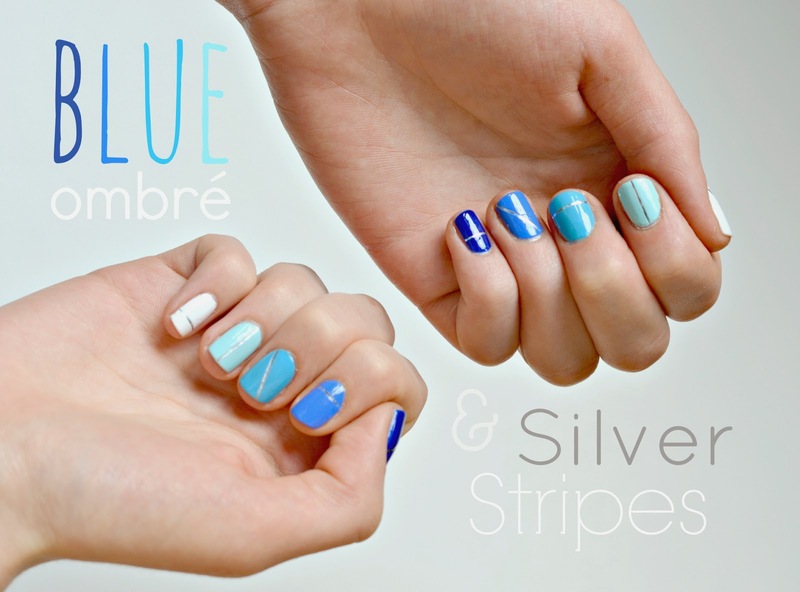 Not only are these icy blue hues extremely eye catching, they're also a nice compliment to my warm-toned skin. After trying my first Ombré manicure in pink (see first here), I knew that a few more renditions had to be created. Read on to see how I incorporated silver striping tape to create a subtly cool design. Colours Used: white- Wet n' Wild in French White Crème, lightest blue- Sally Hansen Complete Salon Manicure in Barracuda, middle blue- H&M in Blue, darker blue- Sally Hansen Xtreme Wear in Pacific Blue, darkest blue- Revlon Top Speed in Royal. 1. Snip pieces of striping tape using cuticle trimmers. Test one or two pieces on unpainted nails to see what length works for you. Be sure to have the strips cut before you start painting to avoid smudging up your polish. 2. After prepping and priming your nails (see my routine here), paint one coat of each shade onto both sets of nails and let that coat dry for a minute or two. 3. 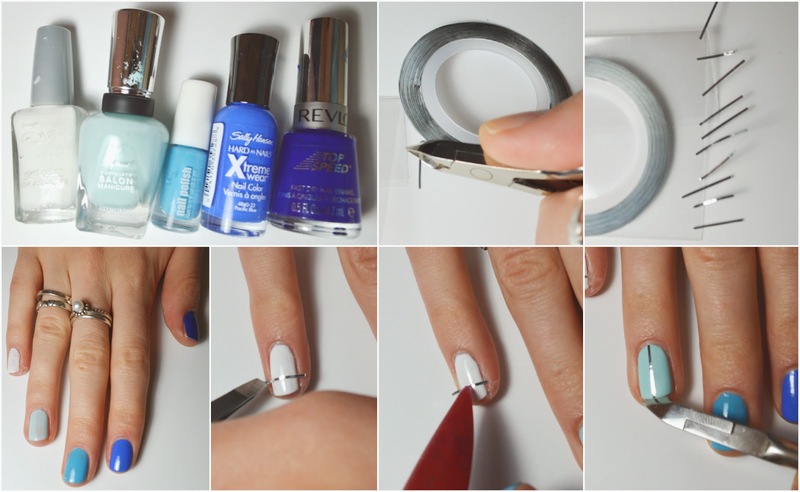 Do each nail one by one: apply second coat of colour, and promptly place your tape onto the polish using tweezers. Be careful to not clamp the strip too tight since the sticky side can adhere to the tweezers themselves. 4. Using some kind of dulled pointed tip, carefully press the tape down onto the polish to create a ridge-less surface. 5. Snip the end of the tape using cuticle trimmers to get the closest cut, then apply top coat after the nail polish has dried. Apply your top coat thick and quick- if you drag the brush across the polish too much, it will smudge the colour onto the tape. As you can probably see by now, this is quite the process. But, if you're on a student budget and have some time to kill, it's either this or a $50 trip to the nail salon! My first experience of trying striping tape was a big fail, since I tried to apply the tape on completely dry polish. Regardless of how thick I applied my top coat, the tape began to peel off my nails within the first three days. Although trying to press the skinny tape edges into the fresh polish is a task in itself, mastering this step in the application will significantly prolong the life of your nail art. I got the ombre inspiration from Lorraine Stannick's Facebook photo here, and the striping idea from Honestly WTF's recent post. I purchased my striping tape here, from Hailthenails on Etsy. P.S. I used OPI's Nail Envy Matte as my base coat and Out The Door for my top coat, both featured here, and my nails lasted an entire week- sans major chips. Can I get a hoo-rah?